Bus and rail firm Stagecoach has been awarded the contract to operate rail routes in England's East Midlands. The Department for Transport (DfT) said the new franchise would begin in November and run until April 2015. However, the DfT has the right to end the deal after six years if Stagecoach fails to meet performance targets. 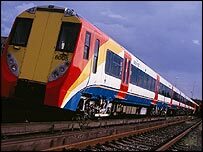 The DfT will pay a subsidy to the firm in the early years of the deal, though over the contract Stagecoach will pay the DfT a total of £133m. Stagecoach is headed by Scottish tycoon Brian Souter, whose company, which began with two buses in Perth, now employs 31,000. Mr Souter said: "We are delighted to be entrusted by the Government with the contract to run a key rail franchise in a region that is the heart of the UK transport and logistics economy, with significant growth potential." The new franchise is a combination of the existing Midland Mainline services from London's St Pancras and the eastern section of Central Trains. Both those rail services had been run by firms owned by National Express. In a statement Richard Bowker, National Express chief executive, said: "We are very disappointed with today's announcement. We look forward to the DfT explaining the reasons for their decision. "I would like to take this opportunity to thank all our employees at Midland Mainline and Central Trains." The service includes a new hourly service between Kettering and London, and an agreement in principle to extend this service to a new station at Corby from December 2008. It is also estimated that journey times between Sheffield, Derby and London will be reduced, saving up to 12 minutes on journeys between London and Sheffield, which at present take an average of 2 hours and 20 minutes. Other promised improvements include £5m being spent on upgrading stations, at least 1,250 extra car parking spaces and the introduction of smart card technology by 2010. Mr Souter said: "We look forward to delivering a comprehensive package of train, station and security investment, improved operational performance, increased capacity, state-of-the-art ticketing options and a range of other customer benefits." The company also said that unregulated fares on the East Midlands service were expected to increase annually by 3.4% above the rate of inflation. Gerry Doherty, general secretary of transport union TSSA, said: "We have already complained to the Office of Fair Trading about Stagecoach increasing off-peak fares by over 25% in five months."